In order to reset the password you’ll need to remove the front bezel. If you are lucky enough to know where your key is or had the foresight to leave your TeraStation unlocked you can skip ahead. “Locks aren’t designed to have all the pins pushed to maximum depths in order to be unlocked, they require specific depths for each pin position and hence a specific key”. Normally you would be correct, but as I said, this is a very cheap lock. 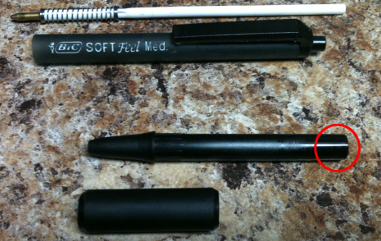 After trying several disposable pens I ended up using a “BiC SOFT Feel Med.” which worked great. Disassemble the pen and remove the ink cartridge and comfort grip from the business-end of the pen. The backside of the piece we are interested in (circled in red below) is a good fit for the diameter of the lock. 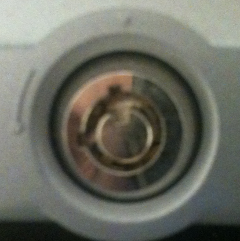 I was able to lock and unlock the TeraStation several times with this bit of plastic with little effort. Now that the bezel is off, look at underside of the display panel on the left-hand side. 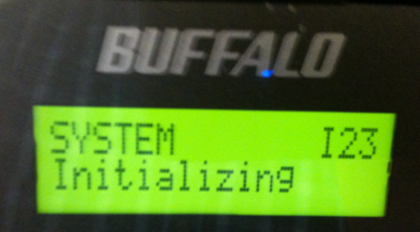 Press and hold the red button until the display reads “SYSTEM Initializing”. The TeraStation will start beeping, the beeps will continue for 30 or 40 seconds. This entry was posted in General Nonsense, System Administration. Bookmark the permalink. Thank you for posting this hint. I also lost my terastation key and was able to open the door by your methods. Lol, brilliant. I was trying all office pens. Your “key” works very well! Even though I wrote this post hoping it would be of service to someone, I’m always suprised when it is. Thanks for the information on an alternative pen, hopefully this will aid someone else in a similar bind. Cheers! if you contact BuffaloTech directly by phone, they will send you a replacement key. mine took about 1.5 weeks to arrive. Good to know, thanks for the tip. Wow, that truly is a terrible lock. Thanks for the tip Chris. Without a pen, the lock on the TerraStation PRO (not the rackmount) can be bypassed by undoing the screws at the back and again on the back to take the cover off. Then the chassis for the front panel can be unscrewed to access the bays. Careful not to touch the big fat capacitors. pen didn’t work, straw disn’t work, cat 7 didn’t work. Going to try the .40 caliber next. I didn’t have either of those pens around – but the posterior side of the plastic part of the zebra F-301 pen worked great also. Also, Buffalo told me they would not replace my key. Perhaps my old Terrastation is just too old now.